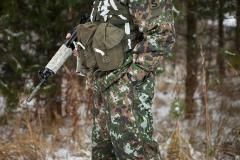 Our improved version of the Finnish military issue M05 cold weather trousers. Our enhanced version features added thigh pockets, a high bib, an improved waist adjustment band and best of all: Climashield Apex insulation. The outer fabric is 70% polyester, 30% cotton, the exact same material used in the latest production runs of the official issue uniforms. Naturally the camo print is totally NIR compliant, so you don´t need to fear looking all lit-up when viewed through NVDs. The lining is 100% polyester. Climashield Apex is a fan-frickin-tastic insulation, this modern hollowfiber is also used by the US military and Crye in their cold weather gear. Our M05 cold weather garments are filled with 100 g/m2 Climashield Apex, this gives great insulation and warmth whilst still keeping weight to a minimum. 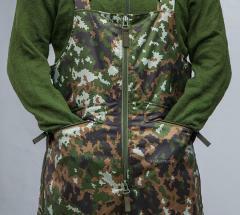 The "real" issue CW clothing is made with outdated 70¨s polyester stuffing, Climashield is approx. a hundred times better than that old junk. 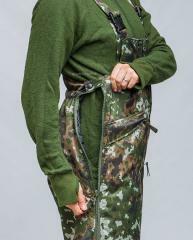 These are sized according to the official Finnish military system, the first digit of the three numbers stands for user height (6: 160-170 cm, 7: 170-180 cm, 8 180-190 cm, 9 190-200 cm) and the following two are the width (waist) according to the European system. After the size number we have have added the recommended user height and waist measurements in centimeters. Regarding height: the user height windows (170-180 cm for example) are the official recommendations as determined by the Finnish military. The truth is naturally somewhere in between, if you are 180 cm long then a height size 7 will probably be just barely long enough for you. So if you are on the very edge between heights and really want to play it safe and like generous sleeve and leg length then we recommend choosing one size longer. 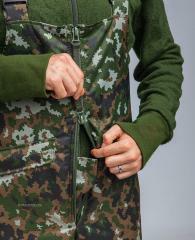 These are designed to be a bit oversized for wear over the summer or snow camo uniform. 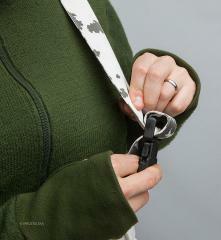 Using the adjustable elastic waist band and suspenders you can adjust the size for a custom fit.